Football Rules Video Slot Guide & Review - Casino Answers! Football Rules is a 5-reel, 25-line video slot found at Playtech online casinos, featuring a wild symbol, scatter wins, a free spins bonus game and a progressive jackpot. You can play the Football Rules video slot casino game at Titan Casino and Bet365 Casino. To play the Football Rules video slot, set your coin size at $0.01, $0.05, $0.10, $0.25, $0.50, $1 or $2. Next, set the amount of coins up to ten times your coin size by using the “Bet Per Line” button. Also, if you want to play fewer than 25 selected paylines, use the “Select Lines” button. The lowest total bet you can make on Football Rules is $0.01 and the highest total bet is $500 per spin. To play the maximum number of coins (10x the coin size) and all 25 paylines, use the “Bet Max” button. To play with your preset values, use the “Spin” button to play. 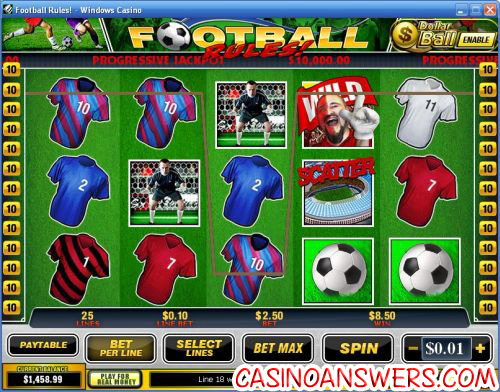 To play for the Football Rules progressive jackpot, enable the Dollar Ball feature. Football Rules’ progressive jackpot is a lottery side game where you must choose 5 out of 49 numbers. If you get all five numbers correct, you will win the progressive jackpot. If you get four numbers, you will win 1% of the Dollar Ball Jackpot. There are also payouts if you match even one number. The Dollar Ball progressive jackpot starts at $10,000. The average hit is around $70,000 and the highest hit thus far is approximately $350,000. Hit five wildcard symbols and you will win the Football Rules video slot’s top fixed jackpot of 10,000 coins. The wildcard symbol is counted as any other symbol besides the scatter and bonus symbols. Only the highest win is paid per line. Winning combinations must be from left to right. Line payouts are multiplied by the line bet. Scatter pays are multiplied by the total bet and added to the line wins. Click on “Menu” and then “Autoplay” to access Football Rules’ autoplay feature. Here you can set the number of autoplay spins (up to 9999). For more options, use the arrows on the left of the autoplay box to expand it to advanced mode. You will be able to choose the following stop settings: jackpot win, single win more than (any amount you choose), overall win more than (any amount you choose) and overall loss more than (any amount you choose). You can also modify the delay between spins. Football Rules’ autoplay feature is fully customizable and can be stopped at any time. While the Top Trumps Football Legends and World Football Stars video slots may have supplanted Football Rules as the best footy-themed video slots on the Playtech casino platform, Football Rules is still a decent video slot that football enthusiasts will enjoy. For an excellent online casino to play the Football Rules video slot at, we recommend you make your way over to Titan Casino. Is there a Football Rules Flash game available for Mac users? Yes, you can play a Flash version of Football Rules at Titan Flash Casino. This is ideal for Macintosh slots players or people who don’t wish to download the casino software. If you can’t get the Football Rules Flash slot game to work, try downloading the newest version of Adobe Flash Player. Can players from the United States play the Football Rules video slot? Unfortunately, casino players from the USA are out of luck when it comes to playing for real money at Playtech casinos. However, they can play the World Cup Soccer Spins video slot at the US-friendly Juicy Stakes Casino. World Cup Rules Casino Game?